Settings for Custom 404 Error Page under “Settings › Reading”. 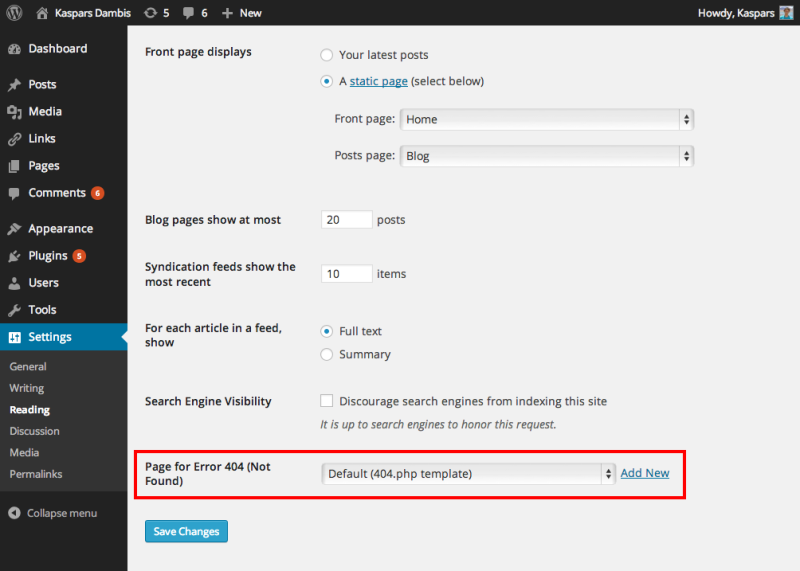 Ever wanted to use a regular WordPress page when a 404 Not Found error is generated? WordPress has support for dedicated home and posts pages but leaves everything 404 related to the theme designer with no option for specifying custom title or content. Custom 404 Error Page plugin resolves that problem by allowing users to set any static page as the 404 error page right from the WordPress dashboard. While the plugin is currently hosted on GitHub, I have applied for it to be included in the official plugin repository. If you would like to help translate the plugin, please visit the translation project on Transifex. This is neat! It would be cool if the same control was offered in the theme customiser too, and after choosing the page the preview panel redirected to it. That is a great suggestion, John! Didn’t think of it myself. There you go. It doesn’t include the preview redirect because it seemed too complex for a tiny plugin like this. Nice. Also like how you code. Fx Benard, thanks for helping out with the Transifex setup! I’ll set up the TX integration to pull in all the translations.